Voyager I, along with its twin spacecraft Voyager II, was launched in 1977 and is now 2/3rds of a light-day away from Earth or 113 AUs. 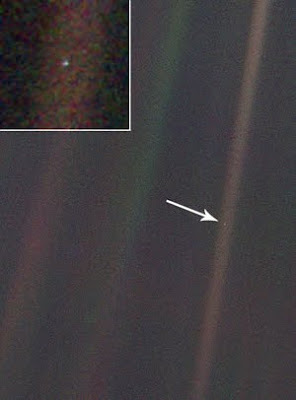 Twenty years ago this week, Voyager 1 snapped the "pale blue dot" image showing our planet from a distance of 43 AUs. This image ranks up there with Earthrise from the Moon (Apolo 8, 1968) and the "big blue marble" (Apollo 17, 1972). Earth is the tiny speck of light indicated by the arrow, and enlarged in the upper left-hand corner. The pale streak over Earth is an artifact of sunlight scattering in the camera optics. In addition to the Voyager twins being the most distant man-made objects in the universe, I have slightly more than a passing interest in the adventures of these little machines. And to think we have a God who looks just like us:o0 It's a miracle!!! I like the spectacular Cassini image of the dark side of Saturn with a tiny earth as a star-like point of like almost lost in the rings.